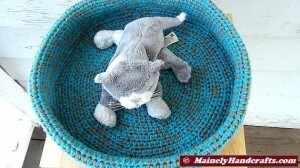 Crocheted, Handmade, & More ...from MAINE! 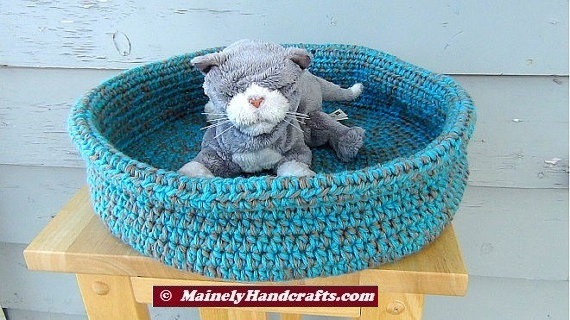 Crochet bed to keep your pet comfy and cozy! 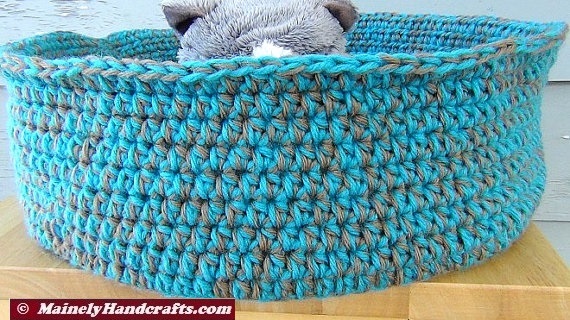 This is good for small dogs or cats, and also makes a great travel bed for pets! This item is now available at our Etsy Shop. 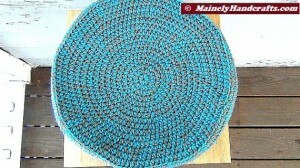 Measures 12 inches across, the sides are 4 inches high unrolled. Sizes for custom-orders may be adjusted bigger or smaller, with adjustment in price to reflect any changes. Crocheted with rolled brim, using a 2 strand method of Robins Egg Blue and Taupe. The Kitten (pictured) is not included and is a Furr-Real mechanical toy. No real animals of any kind came into contact with the basket. 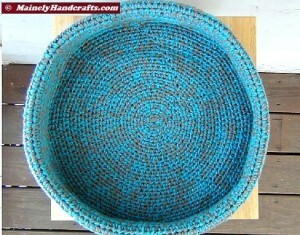 Want it in a different color/colors? Custom orders are accepted! 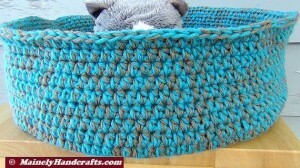 Machine washable and dry-able on gentle, reshaping may be required. Nine months after being listed, this item was SOLD at Etsy.com, today, September 18, 2015.